Last week, we here at Tip n’ Tag scoured the city in search of Amman’s most beloved pizzerias. This week, we’re putting those pizza places to the test with another one of our much-loved Taste-Off competitions. 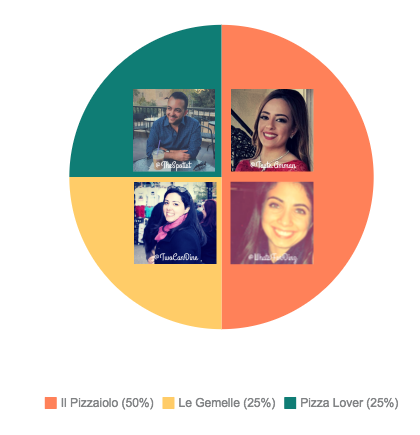 We recruited some of Jordan’s premier food bloggers to help us decide which pizza spots reign supreme. Here’s how it worked: From each of our top five pizza places, we ordered one classic margherita pizza and one specialty pizza unique to that specific restaurant. 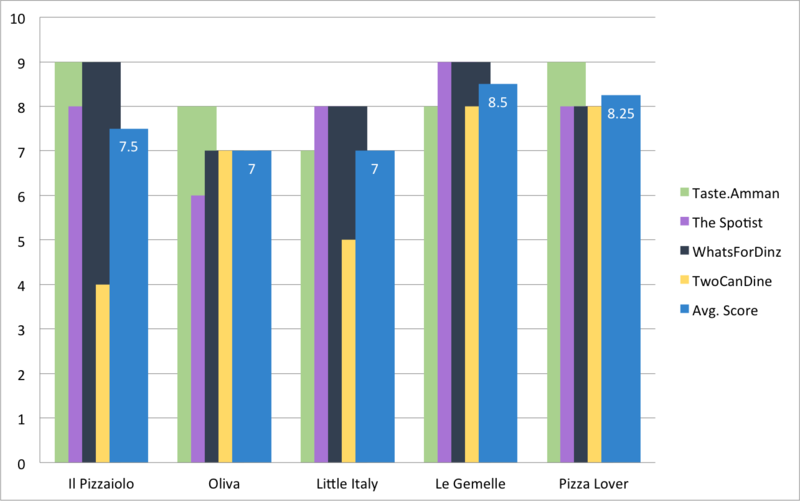 Without knowing where each slice came from, our judges were asked to rate the pizzas according to crust, cheese, toppings, and overall flavor. Then, the judges chose a personal favorite for each category: their top margherita and their top specialty. This competition isn’t just fierce – it’s also delicious. The oven mitts are off! Since opening late last year, Little Italy Pizzeria has been serving up a mouthwatering array of pizzas at its convenient Abdoun location, from the timeless classics to unique creations. With its original location in Dabouq, Le Gemelle has long been a favorite for enjoying delicious, authentic pizza. Now, they’ve got a location in Baraka Mall, too! Run by a top-notch pizza chef who spent over 20 years perfecting his craft in Italy, Il Pizzaiolo is truly authentic – and serves up some truly unique masterpieces. A long-time favorite for foodies across Amman, Pizza Lover is all about serving up consistent quality and delicious flavors at really affordable prices! Oliva’s rustic, cozy vibe extends from its charming Jabal Weibdeh location to the authentic flavors of its delectable pizzas. 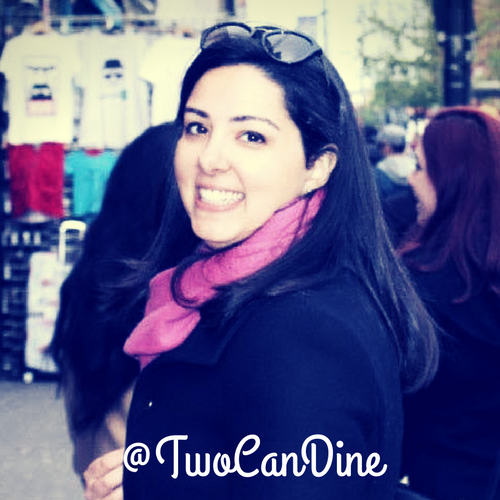 As a food, travel, and photography enthusiast, Dina has combined her three passions into one seriously mouthwatering food blog. Two Can Dine highlights the city’s best dining spots, from high-end cuisine to hole-in-the-wall hits. Follow Dina on Instagram and you’ll never be short of food inspiration! 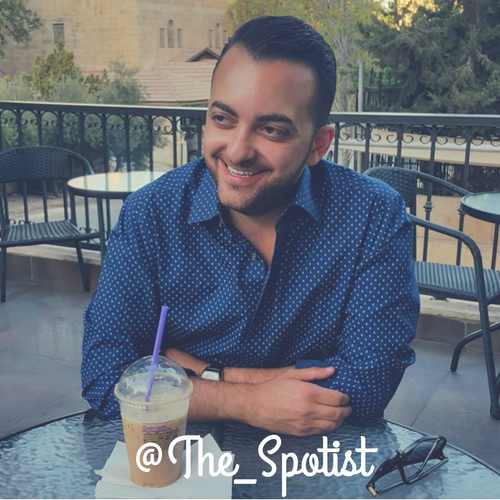 If you’re looking for the latest hotspots around Amman and beyond, look no further than Sam’s comprehensive blog, which combines food, travel, shopping, and more. His in-depth, behind-the-scenes restaurant reviews are a must-read if you’re eager to expand your culinary horizons. There’s no way to avoid working up an appetite while you’re scrolling through Rama’s Instagram or keeping up with her on SnapChat. 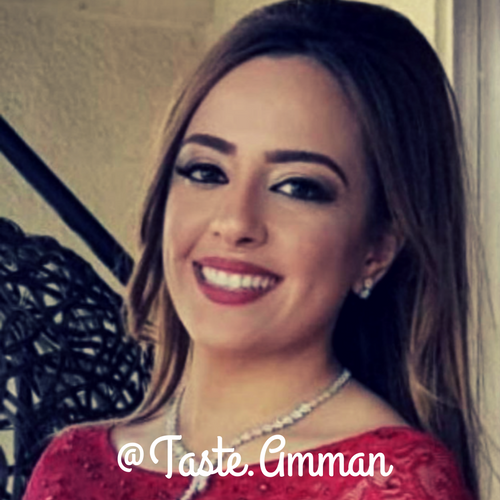 Follow along as she takes on Amman one bite at a time, checking out the tastiest eats and uncovering the creme de la creme of local dining experiences. 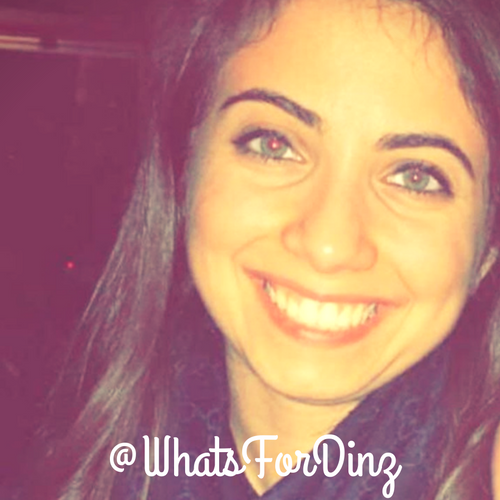 From healthy bites to guilty pleasures, Dina is able to adeptly uncover mouthwatering finds across the globe. Her Instagram is filled with a diverse array of delicious dishes: whether you have a sweet tooth or you’re craving hearty comfort food, you’re sure to find something to fit your fancy. Our judges met up at the Tip n’ Tag office, where we filled them up on some of the best pizza Amman has to offer. After that, it was time to gather their insights and tally up the results! For round one, we brought it back to the basics: the classic margherita. We wanted our judges to be able to compare how well each competitor could serve up the simple and much-loved cheese pizza. The Pizza Lover crust proved to be a huge hit, with Le Gemelle coming in a close second! @The_Spotist was apparently a big fan of Oliva’s crust, giving it 10 out of 10, while @TwoCanDine was less impressed by it. 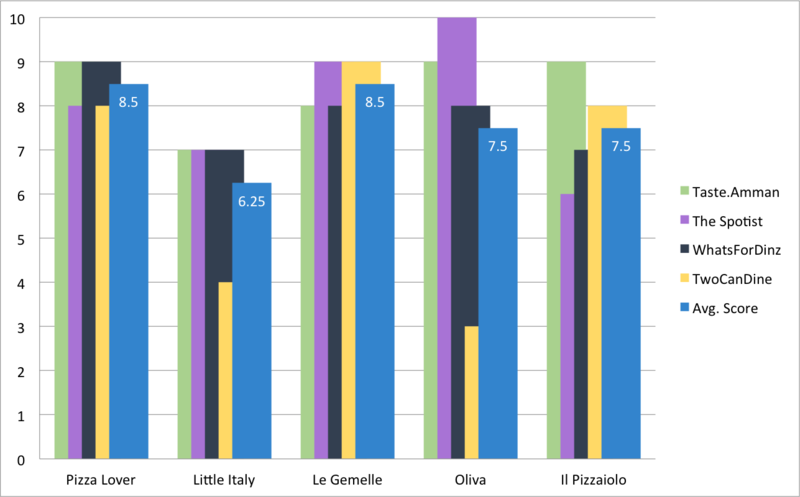 Le Gemelle’s cheese proved most impressive to our food bloggers, with Pizza Lover and Il Pizzaiolo lagging barely a one point behind. 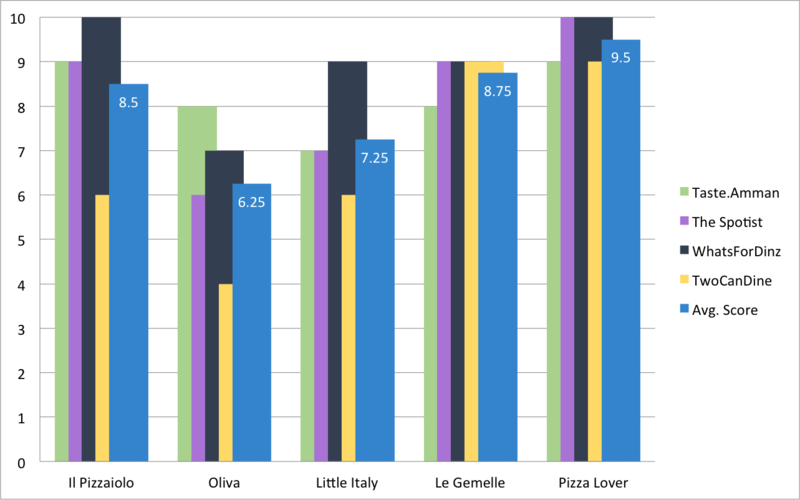 Le Gemelle and Pizza Lover tied for the most points in the ‘overall flavor’ category, proving that these two pizzerias really know how to impress with the basics. 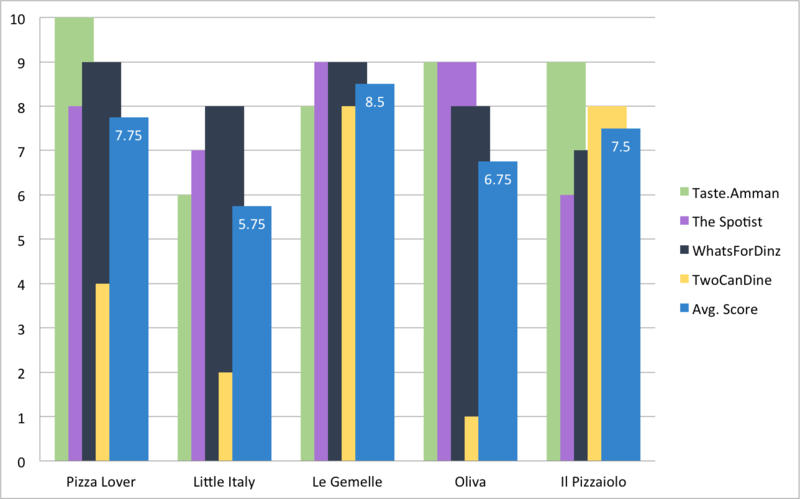 Once again, @The_Spotist gave top marks to Oliva’s margherita. 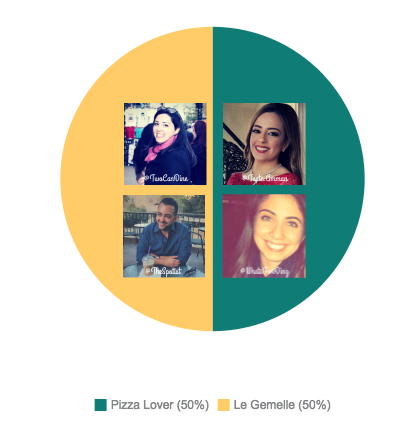 Our bloggers were split right down the middle, with @TwoCanDine and @The_Spotist leaning toward Le Gemelle, and @Taste.Amman and @WhatsForDinz falling for Pizza Lover. For our next round, we switched up the order of the pizzas in order to throw off our bloggers. While some of these specialty pizzas were easily identifiable by our foodie pros, a couple of them really took the judges by surprise! 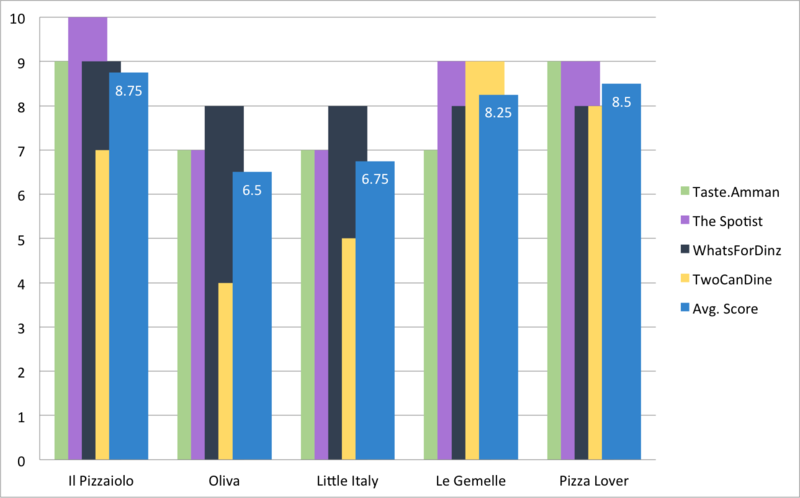 This time, it was the crust on Le Gemelle’s Pizza Speciale that really hit the spot for our bloggers, although the crust on Pizza Lover’s Chicken Alfredo Pizza was only a quarter point behind in second place! The cheese on Il Pizzaiolo’s Pizza Rania really wowed our judges, though Pizza Lover came in a very close second with its cheesy Chicken Alfredo. The chicken, mushrooms, and alfredo sauce on the Pizza Lover specialty really hit the spot for our judges, as did the medley of toppings on Il Pizzaiolo’s Pizza Rania (three of them gave it a 9 or above). On the other hand, our judges didn’t seem too impressed by Oliva’s toppings, with a couple of them calling out the green olives as the unsavory culprit. For overall flavor, it was Pizza Lover’s renowned Chicken Alfredo Pizza that captured our judges’ hearts and taste buds. 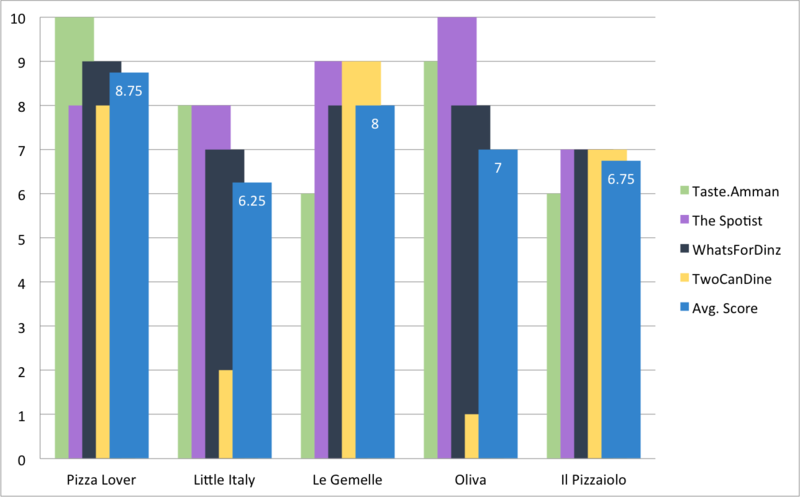 Our judges were a bit more split about their favorite specialty pizza, which is to be expected, given how different some of these pies proved to be. That said, for both @Taste.Amman and @WhatsForDinz, Il Pizzaiolo’s Pizza Rania was the big hit of the night. @TwoCanDine proved to have quite a taste for Le Gemelle, choosing them once again as her favorite, while @The_Spotist just couldn’t get enough of Pizza Lover’s Chicken Alfredo Pizza! In the end, Le Gemelle and Pizza Lover proved to be solid hits all-around, while Il Pizzaiolo showed that they really know how to impress with their specialty dishes! We may be filled up on pizza, but what’s for dessert? To find out, you’ll have to wait for the next edition of The Taste-Off!